By buying this product you can collect up to 889 Yachtaid Points. Your cart will total 889 points that will be converted into a voucher towards your next purchase! Must be logged in to collect points. The Dometic RX7C-417 Series Condenser is the next generation of seawater-cooled, cooling and heating units in marine applications. Designed for installation in the vessel’s engine room or other mechanical space. It is not affected by moisture, normal vibration, or ambient temperatures up to 140 °F (60 °C). No ventilation is required. 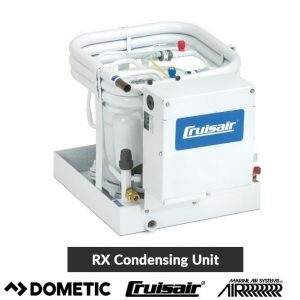 It can be installed with up to two Dometic cooling units, where the total capacity is equal to the condensing unit capacity. 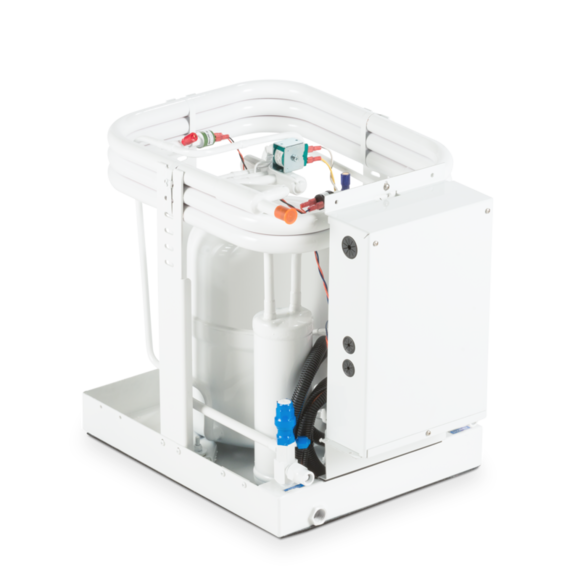 In cooling mode, full performance is possible in seawater up to 90 °F (32 °C).While heating, the unit functions in seawater as cold as 40 °F (4.4 °C). 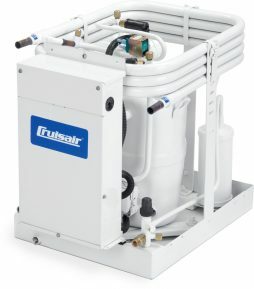 A one-piece chassis/pan has a smaller footprint for easy installation, with two drain connections. Holddown brackets secure all four corners and allow for simpler installation and removal with vibration isolation mounting to reduce noise. The one-piece electrical box with 3 ft. (0.9 m) cable can be remotely mounted. Additional service ports have been added for ease of charging and servicing. The R type unit is designed as a drop-in for the older F and J type with few modifications. Offering reliable operation in tough conditions. I bought it to replace my old unit, which lasted 12 years in my Bertram.